At times, when the unexpected occurs, we recognize with hindsight that the unexpected could have been expected. How do we miss the obvious? What's happening when we do? A popular video floating around the Web is the "selective attention test" by Simons and Chabris. It shows a group of six basketball players, three wearing white, and three wearing black. Each group of three is passing a basketball among their group. Viewers are instructed to count the number of times the white team passes the ball. In the midst of the action, someone in a gorilla suit walks across the court. Because most viewers are focusing on the white team's basketball passing, they completely miss the gorilla. They just don't see it. This failure to notice the obvious illustrates a phenomenon called inattentional blindness, which happens when we're so focused on one visual task that we literally don't see something else that's in plain view. It suggests the possibility that other phenomena can account for our failures to notice or take account of things that are obvious in retrospect. Here are the first two of six tips for reducing the chances of missing the obvious, emphasizing causes that apply to individuals. that are obvious in retrospect?generalize inattentional blindness, which is a visual phenomenon, to the non-visual. Sometimes we become "thought blind" to events, concepts, or information that's obvious in retrospect. 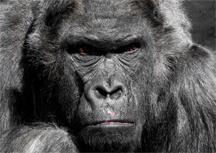 If we're intensely focused elsewhere, we might be unaware of the "gorilla" that just walked across the mental scene. In risk management, for example, we might plan for some risks, and miss others altogether, even when the ones we misssed are more likely. See "Ten Project Haiku:iv" for more. When we're engaged in observation, meta-blindness can arise from a cognitive bias known as the focusing effect, which is the tendency to place too much importance on one aspect of a situation, ignoring others that might be equally or more significant. This tendency also applies to abstract contemplation. For example, the risk of inattentional meta-blindness is high when we focus intensely on difficult subject matter, or when we're under pressure to complete complex tasks. In those circumstances, we often forget to take breaks, or we feel that we have no time for breaks. But that's just when breaks are most important. See "The Shower Effect: Sudden Insights," Point Lookout for January 25, 2006, for more. Inattentional meta-blindness is looking, but not seeing. Not looking is another matter. When we have a favored outcome, when we believe we understand a situation thoroughly, when we have preconceptions about how something came to be or how it will develop, we're less likely to look for alternative explanations or alternative predictions. The more certain we are that we understand what has happened, or what is happening, or what will happen, the more important it is to ask ourselves, "What if we're wrong?" Here's a quick way to do it: ask yourself, "If it turns out that I'm wrong about this, what would I have been most likely to have overlooked?" Would you like to see your comments posted here? rbrenHNcexNALHpPyLHxsner@ChacKOXUBpEKVamPSzQkoCanyon.comSend me your comments by email, or by Web form. Cost reduction is so common that nearly every project plan today should include budget and schedule for several rounds of reductions. Whenever we cut costs, we risk cutting too much, so it pays to ask, "If we do cut too much, what are the consequences?" High-performance teams have customary ways of working together that suit them, their organizations, and their work. But when emergencies happen, operating in business-as-usual mode damages teams — and the relationships between their people — permanently. To avoid this, train for emergencies. When we suddenly realize that our project's scope has expanded far beyond its initial boundaries — when we have that how-did-we-ever-get-here feeling — we're experiencing the downside of scope creep. Preventing scope creep starts with understanding how it happens. The Critical Path of a project or activity is the sequence of dependent tasks that determine the earliest completion date of the effort. If you're responsible for one of these tasks, you live in a unique political environment. When things go wrong, and we look back at how we got there, we must sometimes admit to wishful thinking. Here's a framework for managing the risk of wishful thinking. See also Project Management and Critical Thinking at Work for more related articles. I offer email and telephone coaching at both corporate and individual rates. Contact Rick for details at rbrenfZQWpgEChfTlEqkbner@ChacFFbVFQnRpKEHenrboCanyon.com or (650) 787-6475, or toll-free in the continental US at (866) 378-5470.